Lannds Construction are fully qualified builders in Bromley and Croydon and all surrounding areas including: Purley, Caterham, Selsdon, Sanderstead, West Wickham, Beckenham & Hayes. Lannds qualified builders can offer all aspects of property refurbishment, property maintenance and property development services. They are highly established with a strong reputation accredited by CHAS and GAS SAFE registered to provide full plumbing and heating services as well as carrying out electrical repair work and installations. Lannds have a vast amount of experience, working closely with the client to offer a complete building service, operating in any project build stage, for full or soft property refurbishment services, new builds or house extensions as well as loft conversions and bathroom and kitchen fitting. Lannds provide a full property refurbishment service, including bricklaying, new builds, house extensions, garden walls, roofing, guttering, loft conversions, loft extensions, single and double storey extensions, bathroom fitting, kitchen fitting, plastering, skimming, rendering, flooring paving, tiling as well as a providing plumber and electrical services. Lannds are certified electricians, servicing domestic and commercial sectors. Their electrical services include electrical installations for new kitchens, bathrooms, extensions and loft conversions. Lannds electricians comply with health and safety legislation working within commercial organisations such as schools, libraries, restaurants, bars and hospitals. Lannds electricians offer very competitive rates and a professional prompt service. 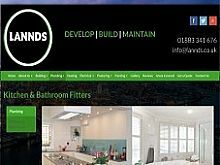 Lannds Construction provide a tailored bathroom and kitchen fitting service including full kitchen refurbishment, kitchen work tops, wall floor tiling and splash back tiling, bathroom suite replacement, bath to walk in shower conversions, shower rooms, and wet rooms. If you need a fully qualified builder in Bromley or Croydon areas, contact Lannds Construction today.